A private island holiday in the Caribbean promises a unique experience with a feeling of seclusion and exclusivity. 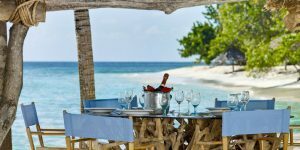 These private island resorts in the Grenadines and the British Virgin Islands offer white sand beaches surrounded by turquoise seas, as well as luxurious accommodation and facilities that allow guests to relax or take part in activities. Call us on 01752 880880 or email [email protected] to discuss your private island holiday in the Caribbean. Book your 2017 holiday now to take advantage of the excellent early booking offers available. Fly to Barbados or St Lucia then continue to the island of your choice by speedboat or plane. 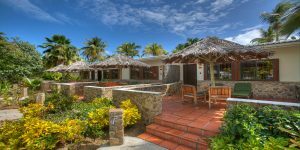 Petit St Vincent is a 115 acre tropical island whose white sand beaches are surrounded by calm, turquoise waters, a perfect hideaway retreat where barefoot elegance is coupled with excellent service and luxurious comfort. Accommodation is in spacious cottages and beach villas which are scattered across the island. Guests can dine in one of the two restaurants, communicate by flag to order room service or take a picnic to the location of their choice. Pristine beaches are almost deserted, numerous activities are available including water sports, tennis, yoga and hiking, while excursions include trips to nearby islands. Stay 7 nights for the price of 5 between 1 June – 31 August and receive all-inclusive plus complimentary return boat transfers. 7 nights from £3375 per person in July 2017 including flights, transfers and all-inclusive based on two people sharing a One Bedroom Cottage. Palm Island Resort promises a laid back yet luxurious holiday experience from the moment you arrive, boasting views of turquoise seas, white sand beaches and swaying palm trees. 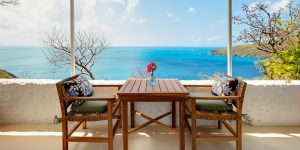 Accommodation is in rooms, suites and villas which have been dotted across the island, some with views of the gardens and many with sea views from their private terrace or deck. There are two restaurants which are both open sided to make the most of the setting. 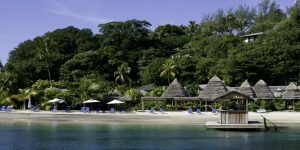 Guests at Palm Island can relax on the beach, indulge in treatments at the new beachfront spa, take part in water sports or visit nearby islands. Book by 30 November 2016 to save up to 25% for stays between 3 January 2017 – 30 April 2018. 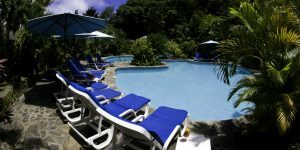 Receive free flights from St Lucia for stays of at least 7 nights. 7 nights from £1945 per person in June 2017 including flights, transfers and all-inclusive based on two people sharing a Palm View Room. 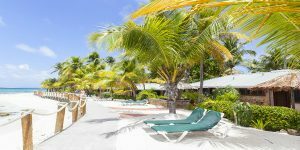 Young Island is located close to the coast of St Vincent and was one of the Caribbean’s first private island resorts, retaining a friendly atmosphere with exceptional service. The island feels secluded and remote, with accommodation in cottages which are on the hillside or by the shoreline. Dining is excellent, with an emphasis on local cuisine and a beautiful restaurant location with guests sitting under thatched gazebos. The infamous Coconut Bar is a short swim from the beach, where guests can sip the freshest cocktails on a floating platform. There are varied activities on offer including tennis and water sports, while other facilities include a swimming pool and spa. Stay 7 nights for the price of 6 between 5 January – 30 April 2017 or stay 7 nights for the price of 5 between 1 May – 19 December 2017. Book by 31 October 2016 to save 10% between 1 April – 19 December 2017. 7 nights from £1550 per person in June 2017 including flights, transfers and all-inclusive based on two people sharing a Superior Room. Fly to Antigua then continue by local airline to Beef Island and onwards by speedboat to your chosen island. 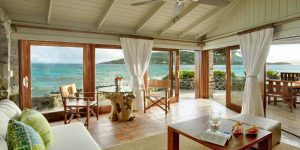 Peter Island Resort & Spa is an exclusive private island resort in the British Virgin Islands which is renowned for its high standards, exceptional service and breath taking scenery. The resort occupies just 300 acres of the 1800 acre tropical island, giving plenty of land to explore. Guests can relax on one of five stunning beaches, participate in water sports including sailing and scuba diving, enjoy a treatment in the excellent spa or join an excursion to discover the surrounding area. Dining is a gastronomic treat with an emphasis on the finest local produce accompanied by superb wine. Book by 30 November 2016 to save up to 30% for stays between 4 January – 19 December 2017 plus receive up to $150 resort credit. 7 nights from £1710 per person in June 2017 including flights, transfers and room only based on two people sharing an Ocean View Room. 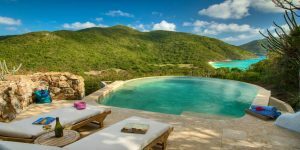 Guana Island is one of the most private and tranquil hideaways in the Caribbean, occupying an 850 acre private island. Built on the foundations of an 18th century Quaker estate, the resort’s stone cottages are home to charming rooms and villas with fantastic sea views. 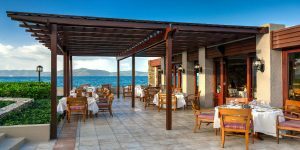 The restaurant serves some of the best cuisine in the British Virgin Islands, incorporating local seafood alongside fresh produce from the island’s organic orchard. Guests can enjoy a range of complimentary activities including sailing, kayaking, windsurfing and tennis, while spa treatments, scuba diving and guided hikes are all available at an extra charge. 7 nights from £2845 per person in June 2017 including flights, transfers and full board based on two people sharing a Seaview Cottage. Call us on 01752 880880 or email [email protected] to discuss your private island holiday in the Caribbean.